The Old Dairy is an ideal retreat for couples or small families. This delightful self catering holiday home is nestled in the village of Bramshaw near Lyndhurst in the New Forest National Park. Only 10 minutes drive away from Peppa Pig World! WE are no longer able to accept dogs. As the name suggests, the building was formerly a working dairy attached to the stable block, in the owner's grounds. Whilst the owners are nearby should you require any assistance, guests can enjoy a good degree of privacy and a relaxing environment with lovely views across the south facing paddock - sit back and relax whilst watching the ponies, donkeys, sheep, free range chickens, geese and emus wander and graze. 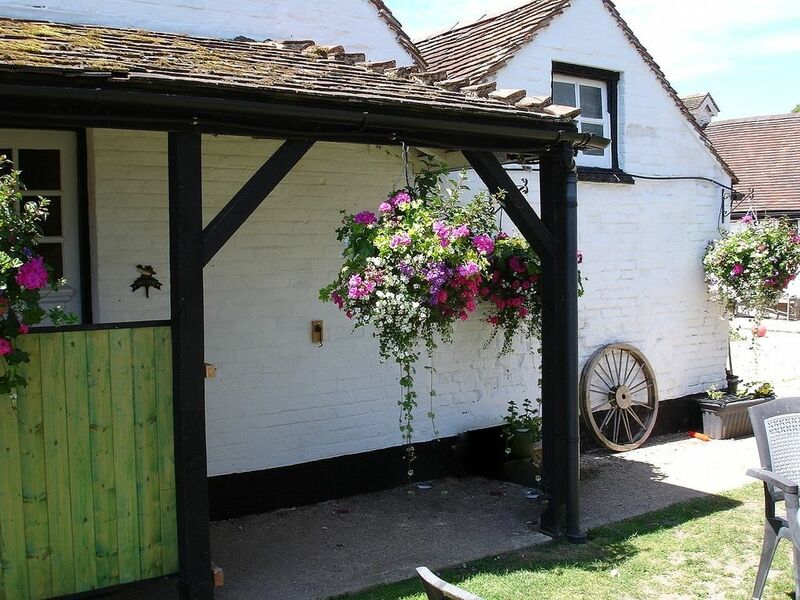 The Old Dairy is ideal for those who want to explore the New Forest whether you enjoy walking, cycling or horse riding. Guests are welcome to bring their own horses to enjoy wonderful open forest rides which are accessible just five minutes away from the property. Ride your bike or horse in any direction and explore the pretty forest villages of Burley and Brockenhurst or venture a little further to Ringwood. There are also some great pubs for refreshments along the way! Easily accessible from the M27, the Old Dairy is conveniently positioned for exploring not only the many attractions of the New Forest, but also great days out at Winchester, Salisbury, Romsey, Portsmouth and Southampton. Alternatively, stay closer to home and enjoy the wonderful forest walks which are just a four minute walk away and then take a stroll to one of the two local pubs for a delicious evening meal. We look forward to welcoming you to our lovely, comfortable retreat in the beautiful surroundings of the New Forest. Please note that the summer months of JUNE, JULY and AUGUST we can only accept bookings for 7 night stays and check in is on Friday. Beautiful, tranquil surroundings in the heart of the New Forest National Park. Fabulous for walking, riding and cycling as well as just getting away from it all! Easily and quickly accessible from the M27. Airport and main train station at Southampton Parkway just a short drive away. Further airport at Bournemouth, approx. 30 minutes away. The Old Dairy is situated in a private location, well away from the road. There is plenty of space to park on our drive. Towels and bed linen are included. A travel cot and high chair are available on request. Shower room including: toilet, wash basin and large shower. Open plan combined sitting area and bedroom. Well equipped kitchen with lovely views. Fridge freezer, oven, hob, toaster, kettle etc. Breakfast bar. Outside: Private contained outdoor space overlooking open paddocks with outdoor seating/dining area and BBQ facilities and comfortable swing seat. Please note we are no longer able to accept dogs. Cleaning / Towels / Linen / Maid service: Towels and bed lined provided. Other: Own private entrance and private outdoor space. Had a very peaceful weekend which was helped by the beatiful weather. Had some difficulty finding the property but after a quick call to the owner was pointed in the right direction. We are pretty quiet people, and this was the perfect place for us. It was a nice little place and fit our needs perfectly. We loved having a place to prepare food in the evenings and mornings. Would recommend. I hope you made it home before the rain started! Thank you for reviewing the Old Dairy, It was a pleasure to meet you and your adorable little dog. Look forward to seeing you again if you come back to The New Forest. On the positive side the owners were very nice people and it was an absolute pleasure living on a small farm. A true delight looking out of the window to see emus donkeys chickens geese dogs and cats. Also horses in the stables. Not to mention how stunningly beautiful the New Forest is and the multitude of fantastic country pubs. Would recommend the area to anyone. However we thought the actual accommodation was lacking. It seemed that it was converted to a holiday cottage with the bare minimum input. It was cold damp and the bed and settee were particularly uncomfortable. The whole décor and fittings were old and tired, it lacked any character or appeal, and was generally just unspecial. Maybe we have been spoiled in our past holiday rentals. I would not recommend this cottage and would advise it needs money spent on it to improve the quality. Thank you for your review. We appreciate your positive comments but were sorry and surprised to receive your negative feedback. You raised no concerns or complaints at all while staying with us and, in fact, told us how much you were enjoying your stay in The Old Dairy! We value our guests’ feedback as it helps us to maintain our high standards. We would have appreciated the courtesy of hearing your views and concerns at the time of your stay so that we could have answered or addressed them. Our guests’ comfort and enjoyment of their holiday experience are of paramount importance to us (in fact, so much so that my husband helped to fix your car during your stay). • The Old Dairy was redecorated in a neutral cream colour in early 2018. The décor is not tired. • We replace the memory foam mattress on the double bed as well as all soft furnishings at the beginning of each season. • The sofa bed was replaced last year. • We have never before received a complaint of cold or damp in The Old Dairy. As explained on arrival, the heating and underfloor heating are controlled by a wall thermostat, allowing our guests to decide for themselves what temperature they are comfortable with. The Old Dairy is a character building on our farm and exactly what it says it is. It is not a new build and we receive an enormous amount of positive feedback from our guests as to its conversion into a holiday cottage. Lovely accommodation set on a small holding. Owners were welcoming and friendly. Accomodation was clean, quaint and perfectly adequate. Dairy over looked the Emu's, ducks, sheep, chickens horses. We really enjoyed our stay at the old dairy and would definitely stay again! Had a great time at the cottage loved watching all the animals, the dogs came and saw us each day Andrea new it was our anniversary and gave us a bottle of prosseco ,lovely lady made us feel very welcome will definitely recommend. A beautiful setting amongst lots of animals. We loved being amongst the animals and were lucky enough to see two lambs born. One thing we would say is that the sofa bed may have had its day as after a few hours we were practically on the floor! As this is the only seating it was a bit of a problem, however as the evenings were mostly dry we sat outside enjoying the peaceful atmosphere. Sorry to hear about the sofa bed, It's an IKEA sofa and was actually new last autumn! However I'll have a look at it and may need to replace it for a different style. It was lovely to meet you and I'm pleased you enjoyed your stay with us. A wonderful location for horse riding, cycling and walking. Miles of uninterrupted riding across the beautiful and ancient New Forest and its open plains. Wide variety of interesting cycle paths. Walkers - the New Forest is your oyster! 30 minutes by car to the nearest beach. The beautiful Cathedral cities of Winchester and Salisbury are each a 30 minute drive away. Booking Notes: Please feel free to contact the owner for any inquiries regarding availability and date flexibility. Changeover Day: Please contact owner Notes on prices: Please call for prices for mini breaks, Christmas, New Year and Easter. Additional charges apply for pets / horses.